Fabric window treatments make a style statement that is both sophisticated and uniquely personal. The exclusive fabrics in the Graber Artisan collection include colors, patterns, textures and weaves that can enhance any home décor, from classic to bold. The soft, high quality fabric adds refinement and warmth to any room, whether formal or casual. 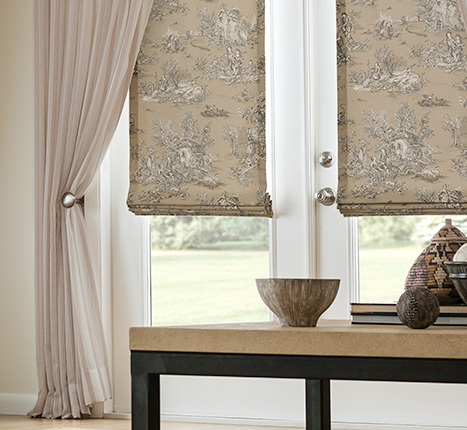 Graber Artisan fabric window treatments include drapery, fabric shades, pillows, fabric by the yard and top treatments. Every window treatment is hand-crafted to the standards of quality and durability you expect from the Graber brand, ensuring you years of enjoyment. We at Bayside Blind & Shade can help you dress your windows with fabric to achieve stunning effects. Welcome family and friends with the timeless beauty of fabric and grace your home with personal style.